Early in the morning 65 years ago today, the greatest generation of numerous allied countries stormed ashore on the assault beaches at Normandy. 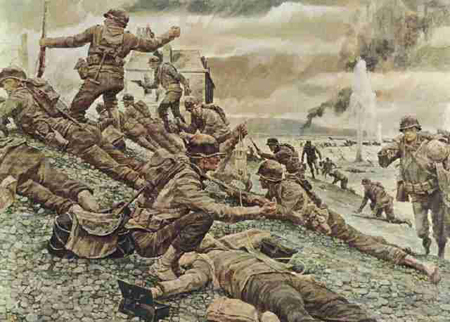 On some beaches, they charged into the jaws of a hellish kind of fire and death that few soldiers ever face. They were mostly Americans, Brits, and Canadians. There were others from Australia, Belgium, Czechoslovakia, France, Greece, the Netherlands, New Zealand, Norway and Poland. Those soldiers and the nations that sent them were responding to the highest human impulses — freeing the enslaved and saving the helpless. Everything didn’t go according to plan; it never does. Mistakes were made, as always. But nothing can diminish the courage of the soldiers who risked and in too many cases lost their lives that day. Some of their accomplishments have gone down in military history — for example, the heroic, nearly impossible assault of U.S. Army Rangers on the 100-meter cliff at Pointe-Du-Hoc. 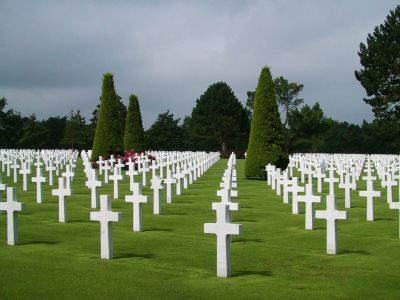 Many thousands of soldiers rest in the military cemetery in Normandy. For those who survived, there can be little doubt that their days since have been troubled by memories of dead comrades and the cold fear that gripped their souls as they charged off the landing craft. The current leaders of the U.S., the U.K., Canada, and France spoke during ceremonies at Normandy today. They came to that solemn place amid petty political bickering among themselves. They said the right things, in the end, and for at least a brief time there was solidarity among them. Most important were the D-Day veterans who were able to be there, that diminishing number of aged heroes who won’t be with us much longer. We owe them far more than we can even imagine. It seems shamefully, that these brave soldiers and their sacrifices are remembered only one day a year. All the other days are used by our European friends to find fault with every thing remotely American. Our President also shares the same contempt. What a sad and hateful way to be. What has happened to us that causes us to clamor for the punishment of an abortionist killer but say little about the man that gunned down two American Soldiers on the streets of an American city? Rest in Peace to all those who fought for our freedoms that made our world what it is today.